If you are coming to Tokyo for a short vacation or a short trip – learning basic Japanese will make it much more fun! You will be able to visit restaurants, stores, and enjoy attractions confidently on your own – connecting with local people! Out of these things – one of the most common things you will face is asking if a store accepts credit card. In areas of Japan that aren’t urbanized – many stores will ask you to pay by cash only. Kaado de ii desu ka? 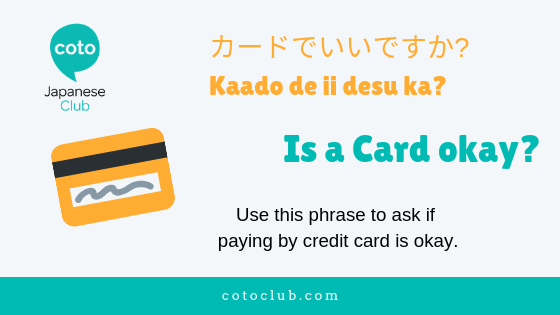 de (pronounced “day”) is a marker that means *by* or *with* as in – can I pay with a card? Credit card – with – good / okay – is it? Whether you are here for a week – or here for a few years – we provide Japanese courses that prepare you for daily life. Make the most out of your stay in Japan and have fun with learning!